Organically Grown and Locally Owned From Our Family to Yours! 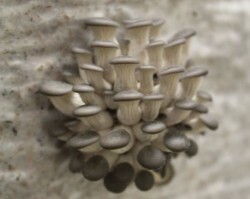 At Mousam Valley, we strive to grow mushrooms as close to wild as possible. We cultivate our fungi on Maine hardwood & straw, sourced sustainably from the very woods & fields we forage in. The end result is a mushroom that could have been picked right off the side of your favorite foraging path. The only difference is that we grow them year round & know exactly when they will be perfect for you to enjoy! 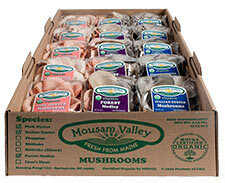 Mousam Valley Mushrooms is a family farm started by father, John Sharood, son Robert Sharood, and daughter Emily Sharood. John has a background in start-up businesses specializing in software-systems and is the paternal backbone to the growing Mousam Valley Mushroom team. Robert is our mycologist and head of quality control from the strains we use to the substrate our mushrooms eat. He is continually updating and modifying his culture library of strains ensuring we always have superior mushrooms. Emily is the marketing & design director who also myco-farms with brother Bob and over sees our lot traceability initiative. 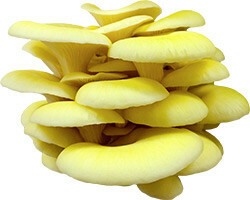 We work together as a team to provide our customers with top quality mushrooms at an affordable price. We love nature but not its surprises. Thus, all of our mushrooms are grown and packed in a totally controlled and fully automated indoor environment, while optimizing the ideal conditions present in their natural habitats. 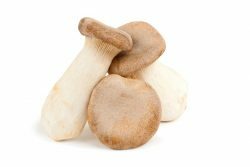 At the same time, it eliminates natural threats such as adverse weather and competitors allowing us to produce savory mushrooms year round! We are located above the Mousam River Valley in Springvale Maine inside of a historic dairy barn that we have renovated into our mushroom farm on twelve acres of farmland. 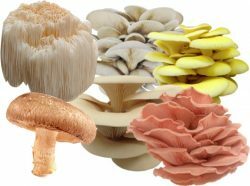 At Mousam Valley Mushrooms it is our mission to sustainably grow and market healthy native and exotic mushroom strains. We maximize customer value while minimizing waste. We do this by using organic agricultural by-products such as local wood chip and straw for our growing medium that in turn becomes nutrient rich compost for local farms. In addition, we are continually researching and developing better more efficient methodologies that use less energy, more innovation. 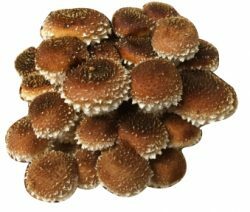 Just like mushrooms we want to create a mycelial network between local mushroom farms where information is shared, so we can all grow together for the greater good of feeding our community healthy delicious mushrooms! It is our ultimate mission. We are a certified organic mushroom farm in Maine and are paving the way for more Maine mushroom farms to become organic certified as well! All of our Oyster & Shiitake mushrooms are certified organic by both the USDA and Maine Organic Farmers & Gardeners Association (MOFGA). We are also pleased to offer a 5-7 day fresh guarantee to all customers from the date of delivery. Not only are our mushrooms harvested and delivered within 24-48 hours of being harvested but they are also exclusively grown for the New England area making them truly fresh and local. 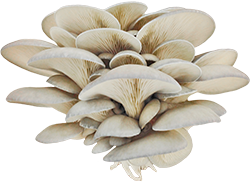 Italian Oysters are the classic Oyster mushroom having a meaty texture and a grey-blue hue. 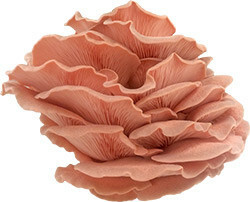 Pink Oysters are actually an all-natural pink color that changes to a salmon color when cooked. These are an exotic tropical species. Our Katahdin Oysters, which are our native Maine strains have a beautiful cream color and are flavor enhancers. Butter Oysters have daffodil yellow flower petal-shaped caps with ivory white stems. The aroma is reminiscent of an aged red wine. Shiitake range in colors from amber to chocolate brown. When cooked, shiitakes release a garlic-pine aroma and have a rich, earthy, umami flavor. 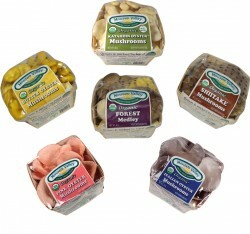 Our variety pack includes a combination of at least 3 of our varieties listed. 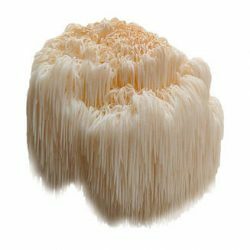 Lion’s Mane is an edible and medicinal mushroom belonging to the tooth fungus group. 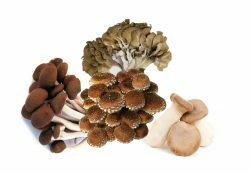 It is a choice edible and is known as the “smart mushroom,” providing support specifically for cognitive function, including memory, and attention. Cinnamon Caps also known as Chestnut Mushrooms form in clusters of leggy orange cinnamon caps speckled with white flakes, ready to sauté and serve. They are similar to Shimeji. The unique robust flavor of the Velvet Pioppino has already made it a hit with chefs. Also known as the Black Poplar mushroom, it has magnificent dark brown caps on long cream colored stems. 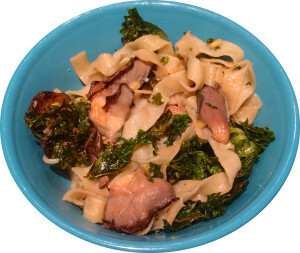 The intense forest flavor makes it a natural for pastas, game, and red meats. Pair with big red wines. The King Oyster, also known as the King Trumpet has a stately appearance and culinary flexibility making it well deserved of its name. These mushrooms have a thick meaty texture and a bold unique taste. They are quite versatile and highly desired as a culinary treat. The dense texture will even stand up to grilling on a BBQ! 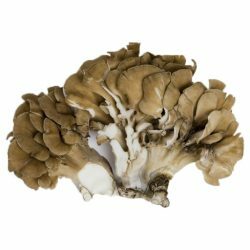 The Maitake mushroom is commonly called “hen of the woods,” since its frond-like growths resemble the feathers of a fluffed chicken. It contains L-glutamate, a natural flavor-enhancer that provides umami, the savory rich flavor that excites receptor-specific nodes on your tongue. It contains compounds which might help fight tumors and stimulate the immune system. There is some evidence that it can lower blood pressure, improve cholesterol levels, and lower blood sugar levels. Our exotic mix contains 3-5 of our exotic specialty varieties. Chef’s choice! We also wholesale the immune boosting superfood Wild Chaga sustainably foraged from the birch forests of the North Woods in dried form. It can be made into teas, tinctures, supplements, and much more. Since this is a wild mushroom it is not certified organic, but contains amazing natural antiviral, antioxidant properties, and more. One of the first things people notice with drinking the tea is that their breathing becomes improved, their energy levels increase and they have more mental clarity. Please call ahead for availability and pricing. Chunks-Powder sizes available. Stop by the farm and grab some spent substrate bags for your garden this year! The mycelium increases plants ability to absorb nutrients and lowers root rot, molds, mildew, nematodes, and other pests. 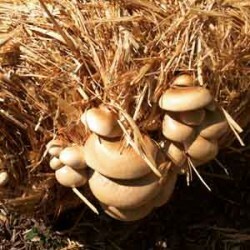 Not to mention, you will have fresh mushrooms to harvest in your backyard! Please call ahead for availability and pricing. 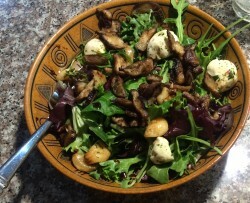 To prepare, a simple sauté is an easy but delicious way to taste the savory flavors of our Oyster & Shiitake mushrooms. 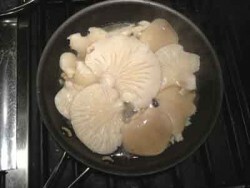 Sauté or fry mushrooms in butter or oil for up to 5 minutes, or cook them with a small amount of liquid such as wine or apple cider vinegar in a covered pan for 10 to 15 minutes. To maintain freshness, keep Oyster & Shiitake mushrooms refrigerated between 35-45° F for up to a week in a paper bag or our individual packaging. If you plan on storing them longer, it is best to cook and then freeze them. This allows you to thaw them out and then reheat when you would like to consume them while maintaining their original texture. You can also dehydrate mushrooms in your oven at 150° F for two hours. Just chop them up into each individual petal removing most of the stem before dehydrating; once they are out of the oven let them continue to dry for a half hour until they are crisp and dry, then seal in a tight container such as a mason jar. To rehydrate, place in water or stock for twenty minutes prior to cooking. 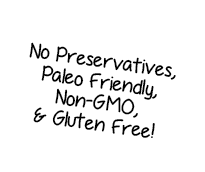 Our bulk boxes are 100% compostable, soy ink printed & made of food grade cardboard; they spaciously hold 3 to 5 lbs. Our 3.5 oz. individual boxes are also 100% recyclable; we use soy ink printed, recycled paper labels, & cardboard berry boxes covered by recyclable shrink wrap. Our bulk trays are 100% compostable printed with soy-ink and carry up to 15 x 4 oz. boxes. They come with lids and are easily stackable on pallets. 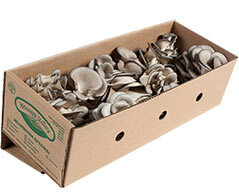 We currently sell local organic Oyster and Shiitake mushrooms that are available year-round. 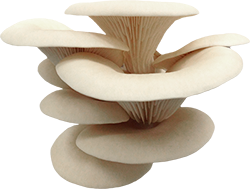 Oyster mushrooms grow in tightly layered non-uniformed clumps and have a similar appearance to bouquets of flowers. 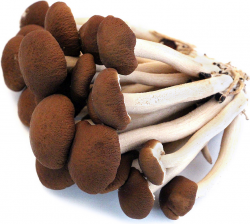 Shiitake, pronounced shee-TAH-kay, range in colors from amber to chocolate brown. 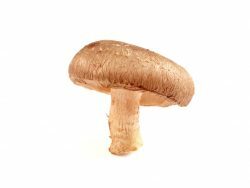 Each mushroom has a wide, umbrella shape with a characteristic curled rim and have a cream-colored interior described as supple-firm. We make sure our mushrooms are always delicious & nutritious. 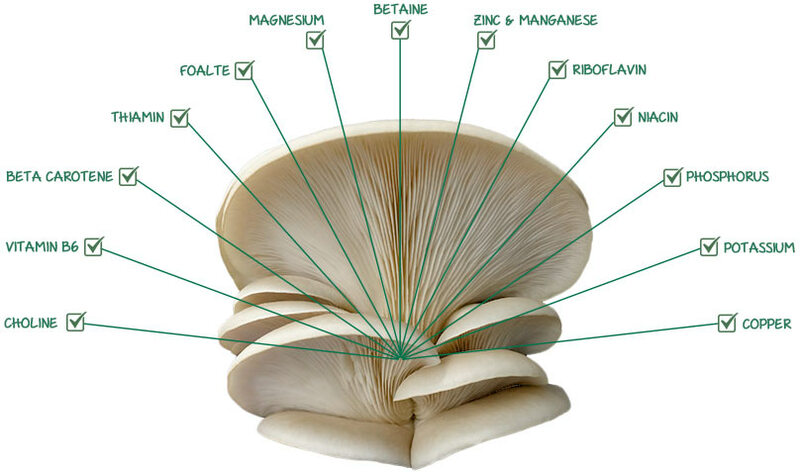 They are grown naturally and safely in an ideal controlled clean environment with plenty of nutrients, ensuring each of our mushroom varieties have exceptional taste and texture. I shop at the Forest Ave. Hannaford in Portland. Absolutely love your mushrooms! Thank you for your hospitality at Open Farm Day. I learned so much about oyster mushrooms and your free samples have inspired me in the kitchen. I look forward to finding your product in the grocery store. I love to support farmers who are so passionate about their work. Just found your Katahdin oyster mushrooms at my local whole foods (Jamaica Plain, MA). Did them up in butter (what else?) along with ham and eggs. Amazed at the great flavor (did not add any salt or pepper) and delighted with the pristine packaging. A great experience that will be repeated often in the future. Thank you and good wishes! Oh my goodness! What a beautiful box of fresh mushrooms! Thank you so much!